Thinking of scooping up some bargain real estate in the U.S.? Follow these five steps to success. Jim Chuong didn’t even visit Maricopa County in Arizona before he decided to purchase real estate in this desert locale. That’s because Chuong wasn’t purchasing a vacation home or a sunspot retreat—he was making an investment. All that mattered to him was whether the numbers added up. Chuong’s first U.S. real estate purchase was a sight-unseen, two-bedroom, two-bathroom condo in a good neighbourhood of Phoenix. He paid just $35,000 for a property that would have cost $145,000 at the height of the real estate boom. Chuong isn’t the only Canadian who is trying to cash in on the bargain prices in real estate south of the border. According to a BMO survey released in the spring of 2011, one in five Canadians was seriously considering purchasing a patch of American real estate, either for personal use or as an investment. That’s because housing prices across the United States have plummeted by nearly a third, on average, since the market peak in 2006. And in some cases—like Choung’s new condo in Phoenix—homes are selling for a small fraction of their former value. Two other key indicators are suggesting that now is an excellent time to buy U.S. property. First, the ratio of house prices to yearly rents has nearly been restored to its pre-bubble average. Second, mortgage rates—both in the U.S. and Canada—are so low that owning real estate hasn’t been this affordable in decades. When you combine these factors with a strong Canadian dollar, you spark the interest of would-be landlords and snowbirds alike. But buying U.S. property can be fraught with unexpected expenses. If you’re not careful, that steal of a deal in Florida could end up costing you tens of thousands extra in the long run. To make sure that doesn’t happen to you, we’ve compiled the top five ways to minimize costs and frustrations when you buy U.S. real estate. Properties across southern Florida are still selling for up to 60% less than their pre-recession values, and just about anyone with a pulse can find a condo for only $30,000. But cheap doesn’t always mean a good deal. A realtor can also act as your preliminary home inspector, providing advice about comparable units and a suggested list of upgrades that will make the place easier to rent. Part of the reason why Canadians consider U.S. real estate investments so attractive is historically low interest rates on mortgages. But the attractive rates advertised to Americans—such as a 10-year fixed at 2.8%, lower than Canada’s prime lending rate—are not usually open to Canadians. That’s because most U.S. banks don’t recognize Canadian credit history, and this can mean major rate hikes for borrowers. “Mortgages don’t work the same in the U.S. as they do in Canada,” explains Alain Forget, RBC’s vice-president of cross-border strategy. Forget explains that in Canada, a bank’s posted rate is higher than what a good borrower will usually pay: you can expect to negotiate based on your income, work stability, assets, length of loan term and credit history. In the U.S., it’s the other way around: the posted rate is the floor rather than the ceiling. If you want to borrow a large amount, expect to add another 25 to 50 basis points, says Forget. Add in your lack of a U.S. credit history, no U.S. assets and a foreign purchaser penalty and you could be looking at a rate of 4.55% or more for that same 10-year fixed mortgage. One way to minimize these penalties is to deal with a Canadian bank that has an American subsidiary. For instance, RBC doesn’t charge a premium to Canadians purchasing U.S. real estate: a savings of at least 1%. Also, the subsidiaries will often recognize a Canadian credit history, which saves at least another 0.25%. Finding a U.S. subsidiary of a Canadian bank isn’t too hard in most states. You can also visit a Canadian branch to initiate a U.S. transaction. Keep in mind that if you buy a property in the U.S. it will be considered a second home and you’ll be required to pony up a larger down payment—typically 20%. There’s another big difference between mortgages in the two countries. While mortgages are often secured in as little as a few business days in Canada, the process can take up to three months in the U.S., because you’re considered a foreigner, and this prompts added diligence from lenders, particularly if you have problems with title documents or a discrepancy in appraisal values. Even refinancing can take 30 days. Of course, you can avoid all of this by paying cash, like Chuong did, so long as you’re buying a relatively inexpensive property. For larger amounts, you could take out a home equity loan against your primary residence. As long as the Canadian dollar is strong, you can take advantage of the extra purchasing power. And, if the loonie’s value starts to fall, you can hedge your loss with your U.S. rental income. Chuong wisely hired an accountant and a lawyer, both well versed in Canadian and U.S. tax laws. Professional fees can be approximately $300 per hour, and even if your record-keeping is orderly, you can expect to be billed an average of 10 hours annually. But the cost is worth it. The accountant went through Chuong’s assets and outlined the required documents for both sides of the border. The lawyer helped Chuong file the necessary paperwork, including getting his ITTN, a U.S. tax identification number. You’ll also be required to pay realtor fees, home inspection costs, title search fees and, in some states, a transfer tax. Many realtors in depressed housing markets have switched to a flat fee rather than asking for a percentage-based commission. “My realtor was my local expert,” says Chuong, “and to charge a 3% commission on a $35,000 condo would mean quite a lot of work for only $1,050.” While fees will differ from state to state, you should expect to pay no more than $3,000 for a flat-fee realtor—which is still far less than the cost of selling a home in Canada. You should also brace yourself for one-time costs that come with the purchase of property. Budget between 1% to 2.5% of your mortgage amount—not the purchase price of the home—for title search and insurance. You can also save yourself a hefty fine by paying a $10 registration fee at the local county’s assessor office to register your property as a rental. Forgetting to do so could result in a fine of as much as $3,000 in some counties. Finally, know when to quit. If you buy more than six properties in any one complex or subdivision you’ll need to file additional paperwork with the Securities and Exchange Commission. “Keep it under six and you can avoid the extra paperwork, hassles and fees,” says Chuong. Approximately $350 to $800 for home insurance, depending on the size and location of the property. About 7.5% to 10% of your gross annual rent for your property manager’s fee. 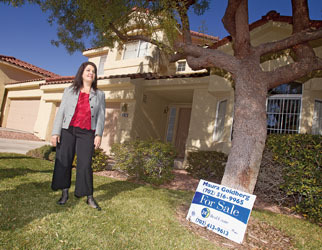 (Unless you plan on regularly inspecting the property yourself, hiring a manager is essential.) If you collect $800 in rent each month ($9,600 annually), you’ll pay $720 to $960 a year for property management, which includes only minor maintenance. It won’t include one-off charges, such as $300 to screen potential tenants, $200 to renew a tenant’s lease, or $300 to evict a tenant. It also doesn’t include property upkeep, such as painting and major repairs. If you buy a condo, factor in the condo fees. “But these are relatively cheap,” says Chuong, who pays $180 per month for his unit in Phoenix. Finally, you’ll need to include property taxes, which differ from state to state. “These taxes could be as low as 0.5% in Arizona or California, or as high as 2%, like in Florida,” explains Forget. (Chuong pays only $500 a year in property taxes.) Also, find out whether the state charges extra non-resident taxes. For example, vacation or rental owners pay at least twice as much in tax as primary homeowners in Florida, and these rates can rise, sometimes quickly, with no cap. Perhaps the single largest reason a U.S. property investment turns sour is a lack of awareness about when or how to pay your taxes—both in the U.S. and in Canada. This is where you’ll need a good accountant. However, there are some general rules of thumb. For instance, if you’re renting out your property for longer than 14 days each year, then you’ll be subject to the IRS’s withholding tax on the rental income. The easy way to deal with this tax is to have your property manager hold and submit 30% of your gross rental income to the IRS. But with this simplicity comes a cost. “You’ll almost always pay much more tax than you need to,” explains Robert Keats, a Certified Financial Planner in both Canada and the U.S., and the author of The Border Guide. Instead, you can file an annual return, showing your income and expenses, in both Canada and the U.S. “Do it right and you won’t have to pay a withholding tax, and you’ll end up paying significantly less in tax each year,” explains Keats. You may be concerned that holding U.S. property will trigger the U.S. estate tax (either upon your death, or when you transfer the property to another family member). However, unless your worldwide assets exceed $5 million—$10 million if you’re a couple—you are not vulnerable to U.S. estate taxes. Keep in mind, however, that this threshold (and these rules) change frequently. If your portfolio does exceed these limits, you may want to consider a cross-border trust or getting a non-recourse American mortgage, both of which can mitigate estate and probate fees. Talk to a lawyer to learn more. Don’t think you can avoid taxes by gifting or transferring title on the property. “This is where Canadians can get themselves into hot water,” says Keats. Unlike estate tax exemptions (which start at $60,000 per person) you only get a $13,000 gift exemption as a non-resident property owner. And if you transfer title on property in the U.S., you’re immediately dinged with capital gains taxes. “These can be really nasty tax surprises,” says Keats. For Chuong, the key was getting help from his accountant and lawyer, especially in the first years. Also, he continues to rely on a local realtor and an onsite property manager to keep on top of his affairs. Since his first condo purchase, Chuong has snapped up an additional property in Phoenix: a three-bedroom home for $55,000. “I don’t plan on selling anytime soon,” he says. For this young investor, there should be a handsome payoff down the road.